The future of our children’s health is “dangerously at risk” if we do not work together to tackle to the “sugar curse”, according to the founder of Diabetes Professional Care. Recent figures have shown more than 20 per cent of 10 and 11 years olds are now classed as severely overweight just before they leave primary school. That is why Diabetes Professional Care 2018 (DPC2018) has added a Live Debate dedicated to the subject with top experts from within the field to its programme. Maggie Meer, who founded DPC after being disappointed at the standard of care she received after her type 2 diagnosis in 2002, said: “We knew that childhood obesity is a significant problem, but what are we doing about fighting the sugar curse we’re being plagued with? Type 2 diabetes is a condition commonly associated with poor lifestyle and the future of our children’s health is dangerously at risk if we don’t take urgent action now. The debate called ‘Preventing childhood obesity – whose responsibility? Policymakers, professionals, family environments or technology?’ will take place from 2.30pm to 3.30pm on Thursday, 15 November. Labour MP Keith Vaz, who is Chair of the All-Party Parliamentary Group Diabetes (APPG) will take part in the talk, alongside Dr Fiona Campbell, Consultant Diabetes Paediatrician at Leeds Children’s Hospital. Dr Max Davie, Health Promotion Officer at the Royal College of Paediatrics and Child Health and Dr Mayank Patel, Consultant Diabetologist from the Southampton General Hospital, complete the debating panel. According to NHS Digital figures, there are currently about 116,000 children who are obese and figures have risen since 2009/10 by 1.4 per cent. Numbers released earlier this year, by the Royal College of Paediatrics and Child Health (RCPCH) indicated type 2 figures were also on the rise among young people. The findings, which were based on data collected from paediatric diabetes units at hospitals across England and Wales, showed the number of people aged up to 25 with the condition increased from 507 in 2013-14 to 715 in 2016-17 – a 41 per cent rise. 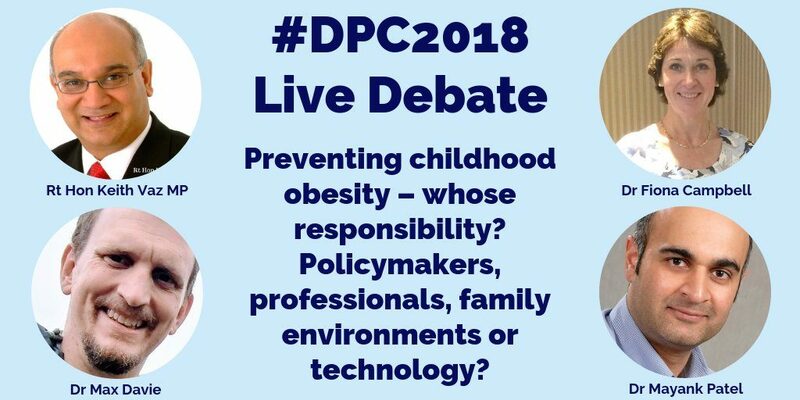 DPC2018 will also address this important topic outside the Live Debate, with sessions throughout the programme – including the Paediatric to Adolescent and Crossover Care and Diabetes Prevention & Obesity in Practice conference streams. DPC2018 is the UK’s only national, free-to-attend and CPD-accredited conference for healthcare professionals involved in the prevention, treatment and management of diabetes, and its related conditions. To book a free place at the conference, click here.